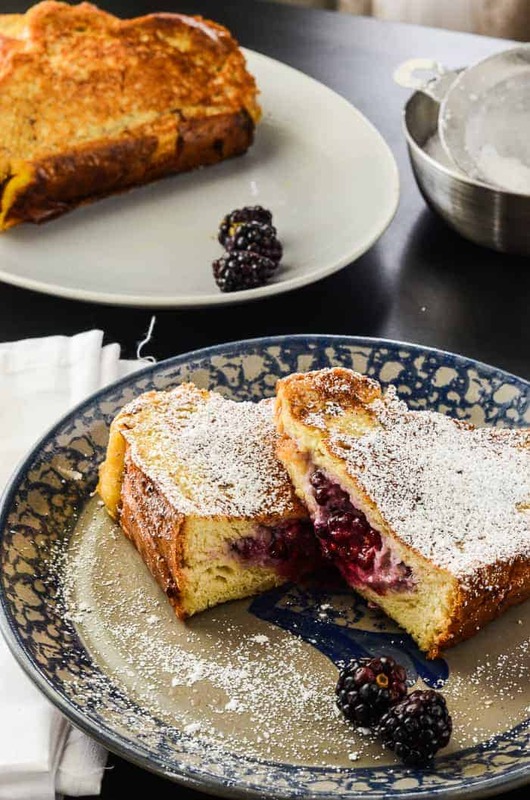 This Blackberry Almond Mascarpone Stuffed French Toast is a springtime twist on the classic, filled with a mildly sweet and tart blackberry mascarpone filling, and dredged in a light almond-flavored custard base. Happy Mother’s Day to all the women out there, young and old, who have the privilege of being called MOM! Yep, it’s Sunday. And no, my calendar isn’t wrong. It’s very rare that I post on Sundays, because my weekends are generally reserved for relaxing and getting away from my computer (and likely working), and I’m pretty sure most everyone else feels the same way. Things are changing a bit here, though, and you’ll be seeing me pop up on Sundays more often now! I am proud and happy to announce that I am now a part of The Sunday Supper Movement. In addition to my collaborations with My Cooking Spot and Hump Day Happenings, I’ve also joined this group of wonderful food bloggers in their mission to bring back #SundaySupper around the family table in every home! 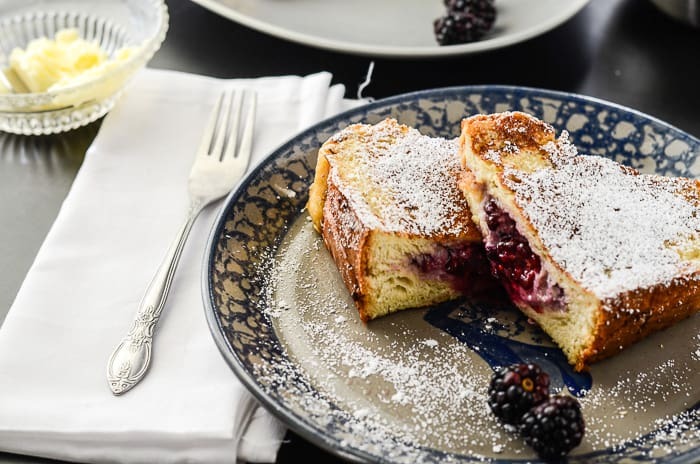 What better way to start a new blogging venture than by celebrating all the moms out there with some breakfast in bed – my Blackberry Almond Mascarpone Stuffed French Toast recipe is easy to whip up, and even easier to devour! I first heard about the Movement on Twitter a few months ago, but I never knew exactly what it was, and being new to blogging and rather overwhelmed, it seemed like something that was a far off discovery. When I signed up to attend this July’s Food & Wine Conference in Orlando (more about that next week! ), I learned more about it, and knew that it was something I had to contribute to. My Nana would have celebrated her 100th birthday this past March (and yes, that cake recipe is finally coming this week! ), and the 10th anniversary of her death was just last week. For those that know me, they know how very important Nana was to me; she may have been my Great Grandmother, but spending her retirement raising me alone on a social security budget made her so much more. She was the only true mother I’ve ever known, and she taught me everything I know about love, life, and being a responsible and decent human being. I honestly owe everything I am today to the lessons she gifted me, and the grace and knowledge she instilled in me. I also credit her with my kitchen talents, of course. How does Sunday Supper tie in to all of this? After she had her two children, she gave up the workforce to become a homemaker, and was the typical trophy wife, so to speak. After spending the day cleaning the house and mending clothes, her family came home to a hot dinner every night. Every. Night. Sundays were always the most special dinners of the week, though. As a Catholic family, the day of rest meant just that, so Sunday was pot roast night (what she called “the good meat.”) Slow roasting dinner while spending the day with the family, not just around them, is what the day was all about. When the roast was almost ready, she’d whip up some of her amazing mashed potatoes, a vegetable, and somehow a dessert was always waiting in the wings. I just wish I had the opportunity to show her how far I’ve come in the kitchen. I think she’d be pretty proud. 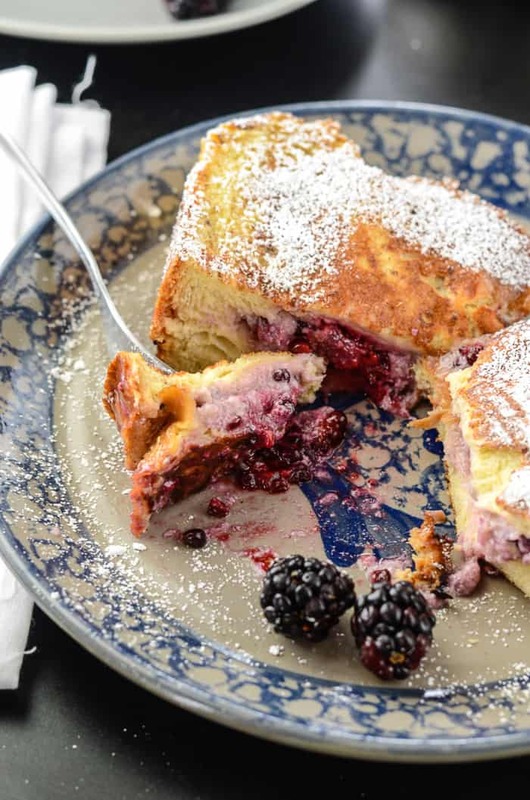 This Blackberry Almond Mascarpone Stuffed French Toast is a testament to the way I wish every breakfast could be in my home! If I had the time, my family would wake up to a warm meal every morning – which would naturally include bacon, coffee, and some fresh orange juice. You know, the staples of the American breakfast. Rich, yet light, and full of my favorite berries and some of the most delicious dessert cheese on the planet, it ‘s a great dish to celebrate not only the moms, but the wives, sisters, aunts, grandmas, and Nanas of the world! Even if you miss whipping this up for Mother’s Day, surprise her with it on a random day. Bring her breakfast in bed, or make her breakfast for dinner. Whatever you do, just be sure to not only tell her, but show her how much you love and appreciate her. You only have so much time to let them know, and you never know when they’ll really need to hear it. Using a small paring knife, create a pocket by cutting through the bottom crust of each slice of bread horizontally. In a small, combine the mascarpone cheese and blackberries. Stir them together, breaking apart the berries to releasing the juice in to the cheese. In a baking dish, whisk together the milk, melted butter, sugar, eggs, vanilla & almond extracts. Heat a large, heavy-bottomed skillet over medium heat, then coat in cooking spray or melt 2 Tablespoons of butter. Using a spoon, stuff each slice of bread with about 2 tablespoons of the cream cheese mixture. Once stuffed, place each slice into the custard mixture for about 10-15 seconds per side. Once the slices are coated, place them into the skillet to brown, working in batches. Cook each slice until golden brown, about 4 to 5 minutes per side. Repeat the process with the remaining French toast. Serve warm, topped with extra berries & powdered sugar4. If you’re cooking a large batch of French toast, transfer the cooked slices to a baking sheet and keep warm in a 200 degree F oven while you cook the remaining slices. What’s your favorite way to eat French Toast? This looks absolutely delicious Erica! Wish I could try some now! Pinned and shared! Oh wow! Now that sure is a scrumptious way to start out Mother’s Day for sure. Or any day for that matter. Welcome to the Sunday Supper team. What a lovely tribute to your Nana. Your French Toast looks absolutely lovely. Have a wonderful Mother’s Day. Oh my word, what a magnificent looking breakfast this is. Mom would love it!! Simply a beautiful brunch recipe for Mother’s Day or any brunch day! What a wonderful way to celebrate Mother’s Day. Your french toast looks divine! Oh my! I like putting blackberries on top of my french toast but this version with them inside the toast along with almonds and mascarpone sounds crazy good! What gorgeous French toast! I’d love this for my Mother’s Day breakfast! So glad you’ve joined us for Sunday Supper this week!!! Welcome Erica! Your stuffed French toast wouldn’t last long at my house! Yum! This is so dreamy!! It reminds me of stuffed french toast I had at a B&B! in a word WOW!!! I’ve never seen French toast like this before. i’m giving you a big thumbs up and five stars!! This looks amazing. 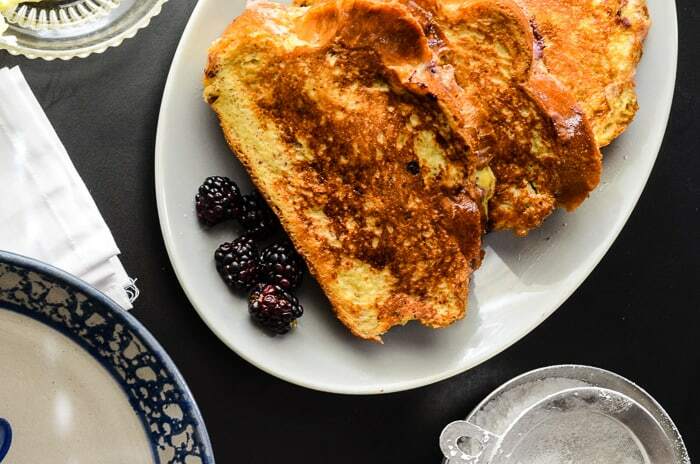 I’ve only eaten French Toast “plain” if you will -this would be quite the treat and perfect for our after mother’s day brunch celebration we are having in a few weeks. Appreciate the step by step-hope ours comes out as good as yours! Ok, I think you are on to something here! 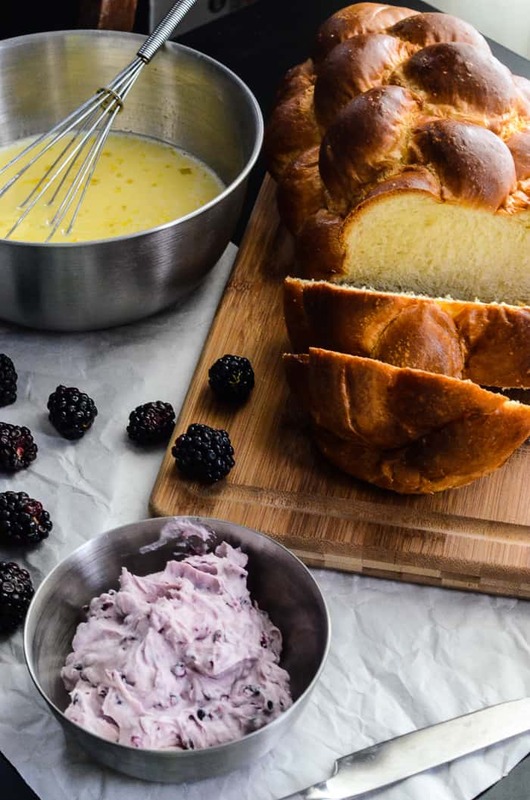 That Blackberry Almond Mascarpone looks amazing! I’m sure it taste as well as it looks in the photograph. Would love to try this dish out! Thanks for sharing! I have to admit that I’m not a huge fan of sweet stuff for breakfast but this looks really good!! Oh, my! Blackberries are my favorite berry and this looks divine. I completely agree, there’s no need to wait for a special occasion to make/serve/indulge this decadent breakfast! I really love that you have joined the ranks to bring some awareness back to #SundaySupper. It’s an important time for our family to reconnect, unplug, and engage with one another…all around delicious meals like this! This looks so delicious! I love blackberries this time of year! Your photography is beautiful. You have nailed these pictures. Oh they are gorgeous, I just want to gobble this up. this French toast looks amazing and I am sure your great grandmother would be proud! I also grew up having Sunday dinners and I miss that! The title alone was mouthwatering! I wish I had seen this earlier and could have had my husband fix it for me yesterday for Mother’s Day. 🙂 Can’t wait to try this recipe! Oh my god. This is the most amazing thing I’ve ever seen. holy moly. This looks so delicious I can practically taste it!!!! I actually rarely eat French toast, but stuffed versions like yours get me every time. My mouth is watering! This looks so delicious! I love love mascarpone! I have to try this out! 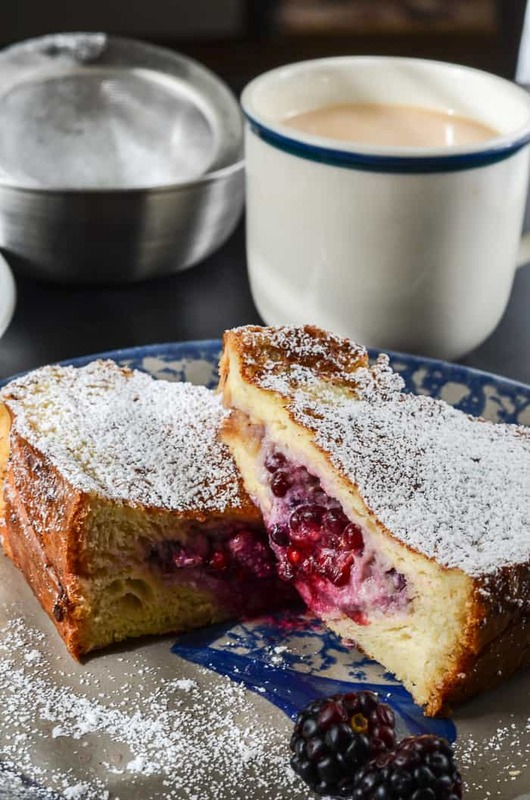 Wow, I would really love to have a bite of that Blackberry Almond Mascarpone Stuffed French Toast. My sister is fond of making pastries, breads, and other treats, and she can try to follow the recipe. Your Nana’s kitchen talents must be super great. We also cherish Sundays and have special dinner that day. Now this looks amazing! I love blackberries and I love mascarpone. I think I’m definitely going to be whipping this one up soon. Yum! What a lovely story! Your gramdmom would be incredibly proud, I am sure of it! Welcome to the movement! I have been a part of Sunday Super for years now – and have attended the last two conferences! I hope to see you there! Girl, you never cease to amaze me. This recipe is insane!! French toast is one of my guilty pleasures for breakfast. It’s especially amazing when it’s stuffed with fruit! This sounds like such a wonderful combination of flavors. I love blackberries! So yummy! This looks incredible!! My grandma was a Sunday Supper kind of woman too. She somehow always had a fresh baked pie that she could pull out of nowhere since grandpa always required a slice in his lunch. She would fry up one of her chickens for special Sundays. I can’t wait to try this with the blackberries growing in my garden! Pinned and shared. Wow!! What a lucky family you have for you to be thinking of them like this on your day! Oh how absolutely delicious! I’ve never seen French toast stuffed with anything before so this is all new to me but I’d love to try it. It’d be a great twist on our usual French toast. Wow! This looks amazing! Great story too! Well this is just ridiculous. I have no idea how you made this come together. IT’s absolutely FABULOUS. Maybe one day you will cook me breakfast. 🙂 I love the blackberries. YUM! I’ve always wanted to try making stuffed French toast at home. Yours looks like it came out of a fancy brunch restaurant! This looks absolutely amazing! I can’t wait to try it!!! Your nana would be proud of you, I’m sure. Reading about her in your post was so sweet, and I’ll tell my kids it’s her recipe when we make this together on the weekend!